Samsung seems to be really dedicated to upping the ante in the customer pleaser tournament. It all started about a year and a half ago, when Sammy first showed that it's hearing the user complaints about Galaxy devices not being "premium" enough, and started experimenting with the Galaxy Alpha and metal-framed Galaxy Note 4. And, of course, that all resulted in the super-shiny Galaxy S6 and Galaxy S6 edge, which evolved into this year's Galaxy S7 and S7 edge, now sporting microSD card slots and waterproofing – two more features, which users were quite vocal about. We've also heard that Sammy is offering some extraordinary customer service plans in some countries, which would possibly, hopefully, extend to most international markets some time in the future. Now, the company is launching the Samsung Members app – a hub that is supposed to be a one stop shop for everything Galaxy-related, especially when it comes to troubleshooting. 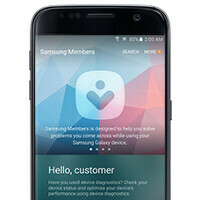 The new app will allow users to run various device diagnostics, including for battery, Bluetooth, and Wi-Fi health and performance, read up on commonly asked questions, or get connected to a support expert for some live help with their Galaxy handset. If all else fails, Samsung Members will also have a feature, which can look for the nearest Samsung authorized support centers. Through the app, Samsung will also be looking to bring a community of fans together by providing message boards. Users would be able to discuss “anything related to Samsung products”. Hopefully, Sammy may also use these boards to read up on what its customers really care about. Lastly, using Samsung Members may net users some benefits and coupons, which could grant them a discount on their next visit to a Samsung store or support center. Apparently, users will be able to get various “levels” of benefits, but it's yet unclear how this would happen. Not compatible with even S6, Then for whom they have made this! I am using S7 in America and it shows No Eligible Device to Install. Not compatible with Samsung Galaxy Note 5, at least not with the SM-N920C variant I have. ... or maybe is the country? Not compatible with S6 International..
Can't download from Galaxy S5 SM-G900H :o ... like wtf, ain't this a samsung device? Sounds like a nice way to improve customer support and reward those who help others. Yea ... would be great if it actually worked in any device! As indicated. Not available on s7 edge. It seems it related to country.